If you’re ready to launch your first author website—or are thinking about giving your old site a fresh update—start by checking out some well-designed existing author websites for inspiration. In the Web Design Relief portfolio, you’ll find plenty of great ideas all in one convenient location, featuring unbeatable examples of effective headers, eye-catching backgrounds, innovative layout ideas, and more! Deciding what to feature on your homepage can be tricky, especially when you’re the author of multiple books and you want to promote more than one of them. 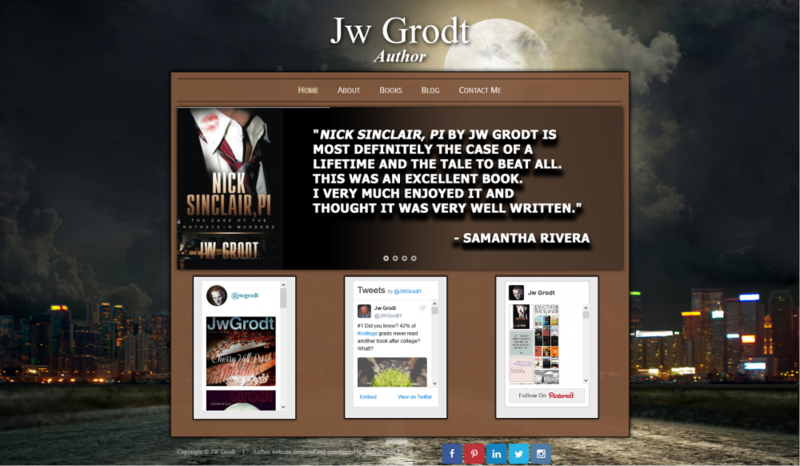 Jw Grodt’s homepage showcases four different books, using an image slider and integrates social media with live widgets. With so much dynamic content on the homepage, visitors are instantly greeted with the newest updates and most relevant information. If you have one project in particular—whether it’s a novel, memoir, collection, or something else—that you want to be the main focus of your website, consider using design elements from your book on your website! 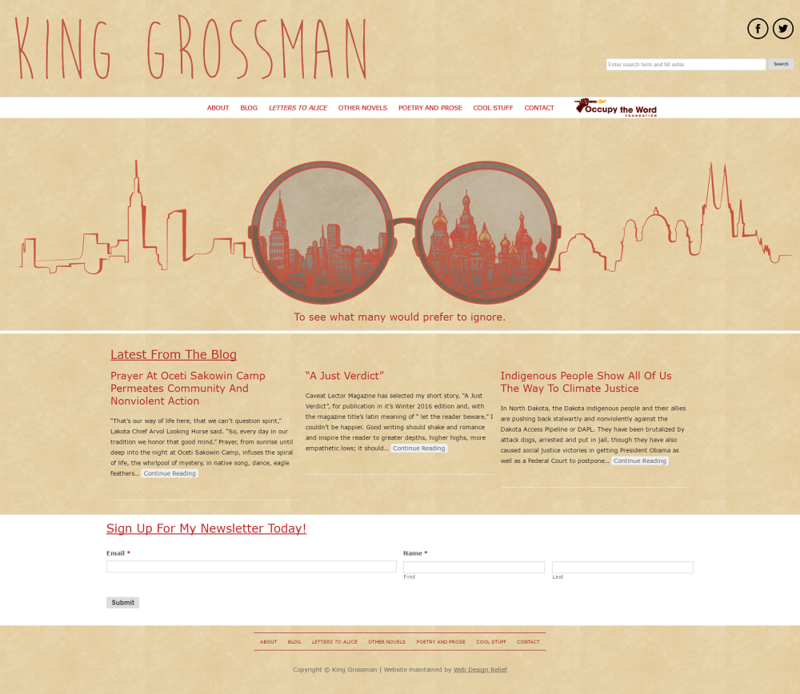 The simple, linear design on King Grossman’s homepage, as well as the red and tan color scheme, are both pulled from the cover of his new novel, Letters To Alice. Not only does this give the website a cohesive look, it also ensures that your featured book is the most memorable element on your website. And if you’re an active blogger, be sure your homepage shows your most recent blog posts so visitors have your latest news at their fingertips. Marketing Tip: Use the same design theme on your author website and all your social media to build brand awareness. Your author website should appeal to your target audience, which is why Tonie Melendez’s website features brightly colored images and links to fun games and activities to attract children and their parents. 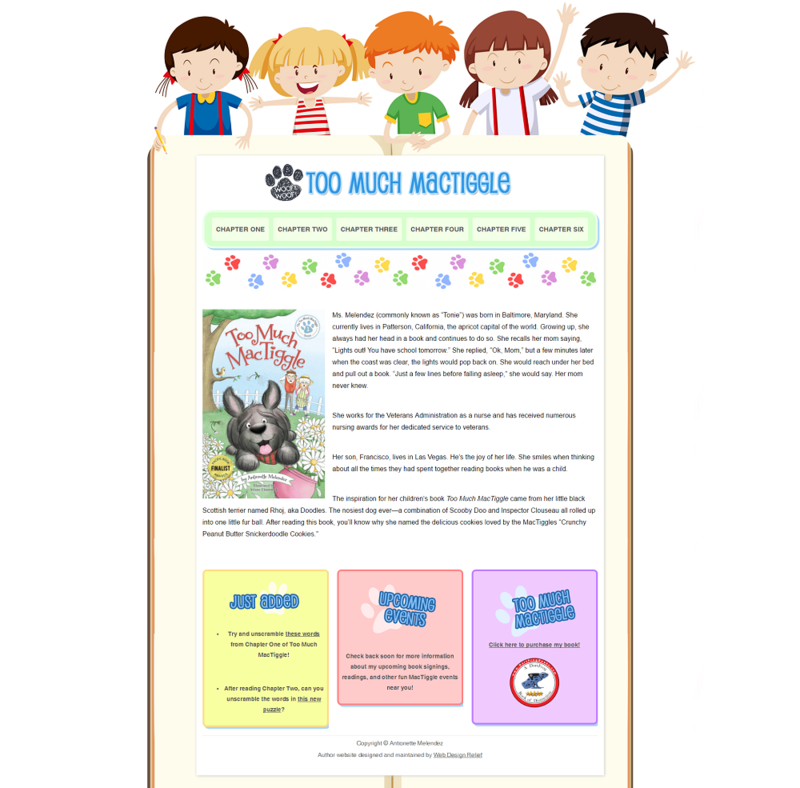 Setting up the main navigation to function like book chapters gives the website an interactive element that encourages kids to explore the pages and learn more about the author and her books. 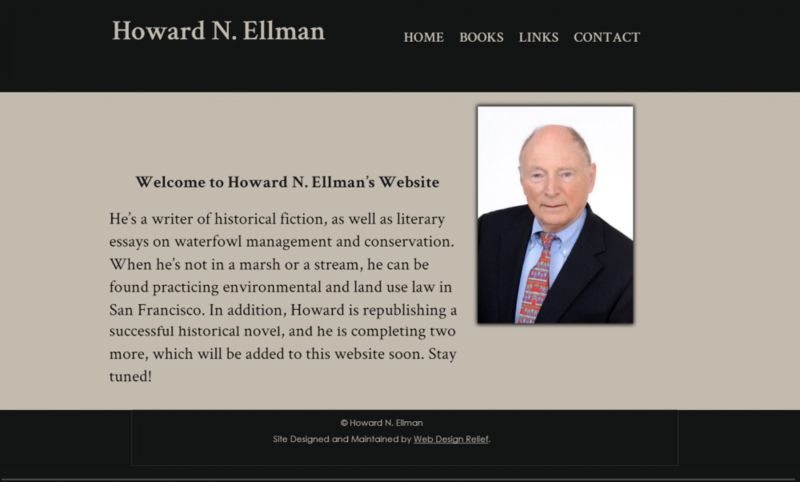 If you’d rather have your website focus on you as an author instead of specific book projects, stick with a clean, classic design similar to Howard N. Ellman’s website. You’ll have a professionally designed site that will appeal to readers, editors, and agents who want to know more about you and your writing. And you won’t need to revamp your homepage for every new publication. Sometimes, simplicity really is the best choice! If your writing tends to evoke a particular sense of place, incorporating images and themes from that location can help bring cohesion to your website, books, and author bio. Max Bayer’s novel takes place in France, so our design experts used Parisian images to give visitors a European feel and connect similar themes across multiple website pages. 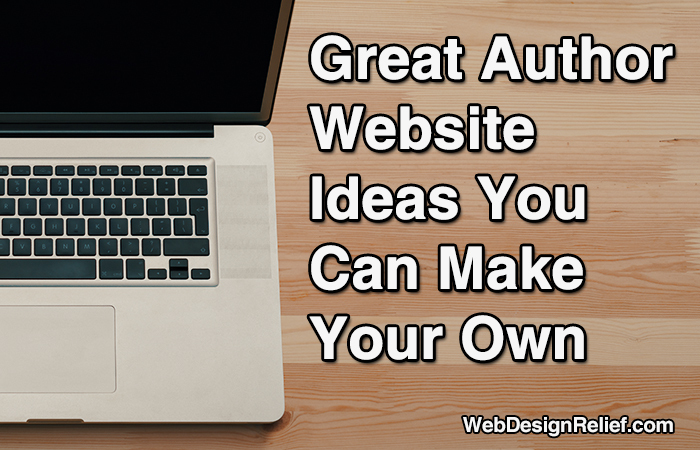 Your author website is the hub of your online identity, so you want to be sure it attracts visitors and works smoothly. If you like what you see here, you can gather inspiration from these great-looking websites to freshen your existing site or create one from scratch. But why not let us do the tech and design work for you? We can give your current website a makeover or design an original, inspiring new author website that your fans and visitors will come back to again and again. Contact Web Design Relief for a free consultation today! Question: Have you ever taken design inspiration from another website?